In 2009, a pregnant woman checked into Northside Hospital, ready to give birth. However, during the birthing process, she suffered from preeclampsia and a pulmonary edema (fluid in the lungs). The woman’s family say doctors did not properly treat her for these conditions, which led to severe issues just a few days later. Three days after giving birth, the woman was undergoing x-rays. She suffered from a heart attack during the procedure. She was resuscitated eventually by hospital staff, but not until about 10 minutes later During that time, her brain was without oxygen. This led to severe brain damage, which left the woman unable to care for herself. The argument was made that the heart attack was caused by high blood pressure caused by the preeclampsia, as well as the pulmonary edema. The plaintiffs claimed these conditions were not properly addressed and treated. However, the defendants argued that, while the woman had shortness of breath before the x-rays, she showed no signs of edema. Her lungs were clear, and she had proper blood-oxygen saturation levels. The defendants further argued that the heart attack was most likely caused by a pulmonary embolism. While experts proved that the embolism probably directly caused the heart attack, there were other mitigating factors that the doctors failed to treat. Specifically, the doctors did not properly treat her fluid levels and erratic blood pressure. After an eight day trial, the jury eventually found the two doctors guilty of medical malpractice. The woman’s family was awarded $45.8 million, including nearly $10 million in economic damages and two awards of $18 million each for noneconomic damages. 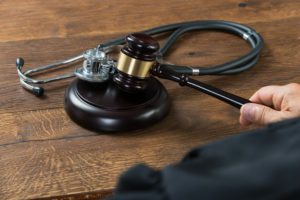 If you or a loved one has been injured or killed due to a medical professional’s actions (or lack thereof), you may be entitled to legal compensation. Contact the Atlanta medical malpractice attorneys at Haug Law Group today for a free consultation today.